In this project we shall build an FPGA imaging platform from scratch. The goal is to interface a VGA resolution CMOS camera with the MiniZed Development board and output the acquired live video feed to a VGA monitor. The complete imaging pipeline will be implemented in the PL (Programmable Logic) section of the SoC. The image above shows the live QVGA video feed from the OV7670 CMOS camera being streamed to the VGA screen. The hardware for this project consists of an OV7670 camera, a ZYNQ FPGA SoC MiniZed Development board, a VGA DAC and a generic VGA monitor. The MiniZed contains an Arduino connector and 2 PMOD connectors. A VGA PMOD will be connected to the two PMOD's while the OV7670 camera will be connected to the Arduino connector via male to female fly-wires. The pins will be configured to operate at 2.5V logic levels so that the electrical interface is compatible. The OV7670 is a CMOS parallel camera with VGA resolution from Omnivison. The camera can operate from 1.7 to 3V. The camera interface consists of a parallel 8 bit bus, synchronization signals VSYNC and HSYNC, pixel clock, master clock, and reset and power down signals. The module for the frame capture was borrowed by Mike Field( Hamsterworks). The camera interfacing code consists of two main modules. The input capture image and the camera configuration image. The input capture code is responsible of transmitting the pixels to the frame buffer. This module decodes the pixels coming from the camera. Each pixel is packed into 2 consecutive bytes. The Input capture modules converts this to RGB444. This is done to save space since the VGA interface uses a RGB444 interface. The camera supports multiple pixel image formats however the one selected in this application is RGB565 meaning Red, Green and Blue gets 5, 6, and 5 pixels each respectively. The camera is configured via SCCB (Serial Camera Communication Bus). This is mostly compatible with I2C. To interface the Minized with a VGA monitor we have to use a current DAC (digital to analog converter). The Digilent VGA PMOD is an R2R DAC composed of two high-speed buffers and an R2R digital to analog converter. It has 12 bit resolution which means 4 bits for each color (red, green and blue), RGB444. The VGA IP module takes the 12 bit pixels and generates the timing synchronization circuits used to interface with the display. Putting the hardware together is relatively simple. Once the VGA DAC is plugged in the PMOD the camera has to be connected to the Arduino connector. The main issue one encounters when implementing the camera on the MiniZed is the limited amount of BRAM the MiniZed has. The ZYNQ XC7007 does not have enough memory to store a complete VGA frame. The workaround this is to store a QVGA image frame and program the VGA IP to output a full VGA frame with the QVGA image at the corner of the screen. The schematic of the design are shown below. The top level design consists of the ZYNQ-7000 PS section and the programmable logic blocks implemented in the PL section. 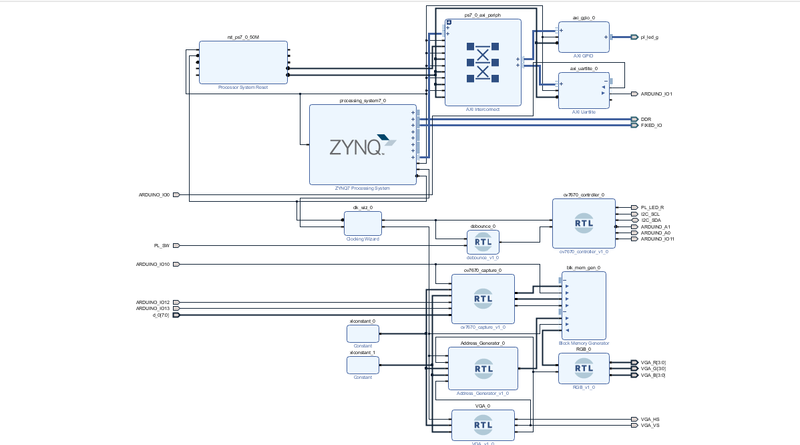 Since all the logic is implemented in the PL this is a streaming architecture. All the data coming from the camera are streamed directly to the VGA screen. The OV7670 Configuration module implements the I2C protocol in HDL and the commands are read from a LUT (Look up table). A dual port BRAM is used to store and read data from. The pixel clock sources PortA clock of the dual port BRAM. Port A of the BRAM is used to store the image from the camera. Port B of the BRAM is interfaced with an address generator which reads the data and pipes the pixels to a VGA IP module. The clocking wizard generates a 25.175 MHz clock which clocks the VGA module. This is the required clock for a resolution of 640x480. The second clock of 50MHz is used to clock the configuration module. After the synthesis and implementation stages a bitstream will be generated. Next steps are to launch the SDK, create a Hello world project, transfer the bitstream and run the app. The image below shows the complete hardware platform kludged together. It's important to keep the length of the wires short to avoid signal integrity issues. One important note is the configuration of the camera with the proper settings. Below one can see the trippy effect one gets when configuring the camera to output in YCbCr image format. As mentioned the correct format for the architecture above is RGB565. This will recreate the complete project. This will result in a continuous video feed being transferred to the VGA screen at 30 frames per second. That pretty much concludes the project. This project showed how to interface a CMOS parallel camera with an FPGA SoC. The QVGA camera frames are streamed to a VGA monitor at 30 frames per second thereby implementing a complete imaging platform on the MiniZed SoC. -- one pixel every 4 cycles. TCL file to recreate the design. # Please add the sources of those modules before sourcing this Tcl script. # <./myproj/project_1.xpr> in the current working folder. set errMsg "Please set the variable <design_name> to a non-empty value." common::send_msg_id "BD_TCL-001" "INFO" "Changing value of <design_name> from <$design_name> to <$cur_design> since current design is empty." common::send_msg_id "BD_TCL-002" "INFO" "Constructing design in IPI design <$cur_design>..."
set errMsg "Design <$design_name> already exists in your project, please set the variable <design_name> to another value." common::send_msg_id "BD_TCL-003" "INFO" "Currently there is no design <$design_name> in project, so creating one..."
common::send_msg_id "BD_TCL-004" "INFO" "Making design <$design_name> as current_bd_design." common::send_msg_id "BD_TCL-005" "INFO" "Currently the variable <design_name> is equal to \"$design_name\"." common::send_msg_id "BD_TCL-006" "INFO" "Checking if the following IPs exist in the project's IP catalog: $list_check_ips ." common::send_msg_id "BD_TCL-006" "INFO" "Checking if the following modules exist in the project's sources: $list_check_mods ." common::send_msg_id "BD_TCL-008" "INFO" "Please add source files for the missing module(s) above." common::send_msg_id "BD_TCL-1003" "WARNING" "Will not continue with creation of design due to the error(s) above." -- c-a-d du 0 à 799.